Plumbing Vs. Pipefitting: Which Career Path Is For You? Plumbing and pipefitting are two distinct specialties. However, since both involve working with pipes, many people tend to think of these two career paths as one and the same. The reality is that plumbers and pipefitters are very different in terms of their daily job description and the environments they work in. Also, while both need a similar level of post-secondary education, there are some differences in salary. The differences between these two careers will be explored in more detail below. While plumbers and pipefitters both work with pipes, they work with different systems. For example, plumbers work with pipes and fixtures related to drinking-water systems and wastewater disposal systems. They work with more basic types of pipes than pipefitters, primarily copper and PVC. Part of their job description is repairing clogs, installing and repairing pipes, toilets, and water heaters and repairing garbage disposals. Plumbers tend to work for big or small companies and work primarily in residential homes. Sometimes they will work in commercial settings. Pipefitters, in contrast, work with pipes related to refrigeration systems, boilers or HVAC systems. Some of these pipes are designed to handle high pressure and therefore can handle more hazardous materials like chemicals or steam. 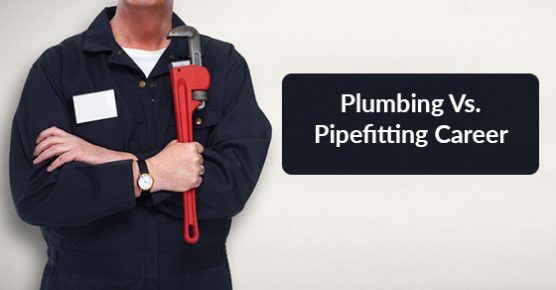 Pipefitters work with more specialized pipes than plumbers. They also work in industrial or manufacturing settings such as power plants or factories. Both plumbers and pipefitters need to undergo apprenticeships in order to become licensed. Apprenticeships involve on-the-job training and in-school training. On-the-job training requires 8,280 hours, while in-school training requires 720 hours. Overall, the apprenticeship for these careers typically takes 5 years to complete. For more information, consult the Ontario College of Trades. Plumbers and gasfitters tend to make a similar salary, with pipefitters make a bit more on average. In Canada, the average plumber makes $26.42, while the average pipefitter makes $34.07. Keep in mind that these are approximations and are subject to change. Both professions are in high demand. In short, plumbers and pipefitters work with different systems, different materials and in different environments. Pipefitters tend to work with more hazardous materials, but they are also compensated more for their time. Both need to undergo a similar level of post-secondary education. If you are in need of more information about a plumbing or pipefitting career from real professionals in the industry, contact Advanced Plumbing, the plumbing experts. Call us at 877-286-8044 or contact us online here.